Despite being on cable instead of network TV, on Friday, October 2, Stargate Universe premiered to the best franchise premiere performance in four years, drawing more than 2.3 million viewers – and besting FOX's Dollhouse at 9PM (ET/PT). 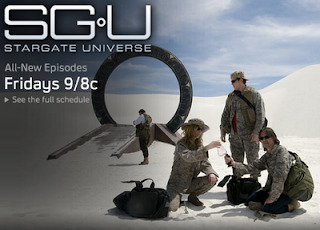 SGU, which stars Robert Carlyle, Lou Diamond Phillips, Ming-Na and David Blue, grabbed 2.35 million total viewers along with a 1.7 household rating, 1.32 million adults 25-54, and 1.12 million adults 18-49 during its two-hour debut episode from 9-11 PM (ET/PT). For those who missed it the first time around, SyFy is repeating the show throughout the week, or you can watch it online here. I'll be posting my Ming-Na interview later this week, as well as a layman's review of the series. Check back! !